Maine wedding transportation includes limousines, horse drawn carriages, schooners and hot air balloons. That long, white, sleek acre of car pulling up in front of your wedding venue certainly does impress the guests. A perpetual favorite, limousines are classy, comfortable and a mainstay at traditional weddings. There is no shortage of competition, particularly in the larger population centers like Portland, Augusta and Bangor. That same competition has resulted in a number of creative and in some cases unusual types of limousines. Settle back in a 1962 Bentley, the right hand drive giving the car a decidedly upper crust British twist. Heading into Maine’s lightly populated interior? Negotiate the slightly less forgiving roadways in a stretch Hummer, complete with leather seats, full bar, neon lights and a twinkling star head liner. There’s room enough for the entire wedding party. How about a 20 passenger limo bus complete with karaoke machine, fiber optic lighting, media center and bar? Most limousine companies charge by the hour. Weddings normally have a three hour minimum which includes the trip to the reception and the welcoming bottle of champagne. Prices vary depending on the type of limousine you choose, time of year and sometimes day of the week. Book your limo at the same time you finalize your wedding venue, the sooner the better. Saturdays and the summer season book up quickly. 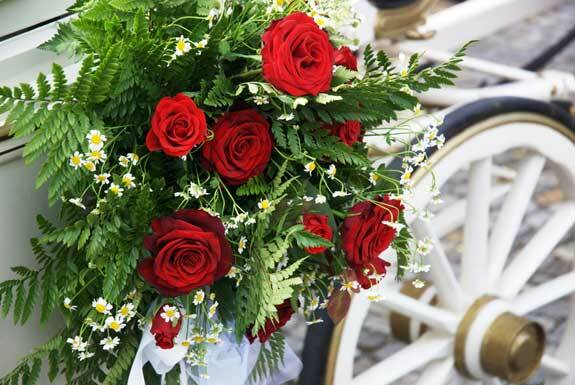 Perhaps you’d rather trade that modern day limo for a romantic, sculptured horse-drawn carriage. Fashioned after the open-air caleches found in Quebec City or Montreal, these carriages add a nostalgic Victorian twist to your wedding day. Outfitters are found in the greater Portland and Casco area, as well as in Acadia and the interior. In winter, some outfitters exchange the carriage for a horse drawn sleigh. High View Farm in the Lakes Region offers full wedding packages at their farm, including a sleigh ride, the ceremony and a celebratory bonfire. Again, book this type of service as soon as possible. Most firms charge by the hour, some have minimums. Rates depend on type of carriage, one or two horses, the time of year and day of the week. Yards of ivory sales billow above your head, catching the wind as you whip across the waters of Casco Bay. You stand on the deck of an early 20th century schooner, exchanging vows with your dress similarly billowing in the wind. After the ceremony you and your guests arrive at Cow Island for a traditional lobster bake. Kick off your shoes; scrunch your toes in the sand and party. Then head back to the mainland, drop off your guests and sail to an anchorage off a secluded island for an overnight stay. This is wedding transportation and a celebration of the most nautical kind. Price is based on ship, time of year, number in party and amenities. For a real Maine wedding with a view, why not have your wedding in a hot air balloon? Maine Balloon Rides has pilots available all over the state and one of their specialties is weddings in the sky. Exchange vows on the ground with family and friends and then take your first scenic flight as man and wife. Or, all of you climb into multiple balloons and have a wedding in the sky. Then you all float back down to earth and celebrate with champagne and fancy treats. Prices depends on amenities, number of guests and whether you say your “I do’s” on the ground or a bit closer to Heaven, surrounded by your friends. This is wedding transportation and the ceremony itself, both with an adventurous and memorable twist.